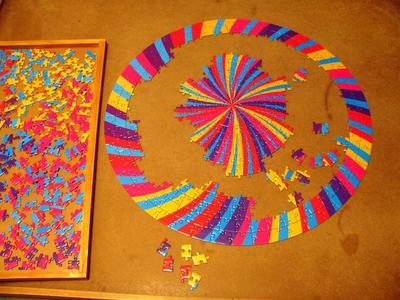 MULTICOLOR WINDMILL 500 PC ROUND PUZZLE BY BGRAAMIENS. 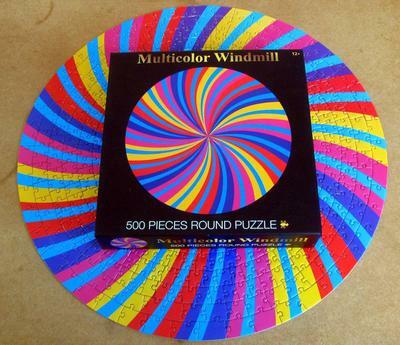 Unique and challenging multicolor windmill puzzle. This is a Bgraamiens puzzle that is manufactured by Panley Paper. The puzzle comes in a sturdy and nice-sized, easy to store box. I decided to take on this puzzle because of it's unique and colorful design, and because of my previous good experiences with the brand. This puzzle had a variety of shapes and sizes to the pieces. The largest pieces form the outer edge of the circle. I found the border and the circles closest to the border AND the center, and the circles closest to the center, the easiest to assemble, with the middle circles being more difficult and at times a bit painstaking. I did the puzzle without using the color-coded back and found the puzzle to be Advanced Level in difficulty. It was a bit harder than other concentric puzzles I have done in the past, in part due to the slightly smaller than average middle pieces. I also had some difficulty finding a pattern to the piece shapes for the various layers so I assembled it almost totally by color alone. After completing the puzzle, I took it apart and re-assembled parts of it after sorting based on the color coded backs. There was very little challenge to assembling it this way, and completing sections was quite fast. Piece quality was about 8/10. I found these pieces a bit more vulnerable to wear than other Bgraamiens puzzles I have assembled. I had about 8 pieces that were still partly attached and not fully cut through and 1 piece that had slight damage, but nothing that affected the overall appearance of the puzzle. The puzzle was fun to assemble. There was virtually no puzzle dust. The colors were vivid and the pieces were easy to sort into color combos. Overall, I had a good time assembling this puzzle. 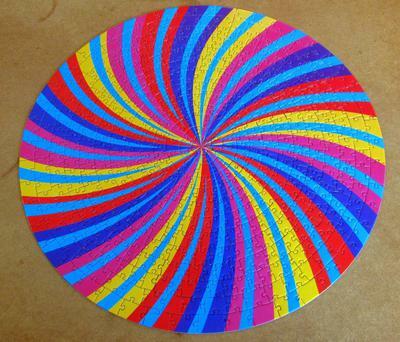 Comments for MULTICOLOR WINDMILL 500 PC ROUND PUZZLE BY BGRAAMIENS. 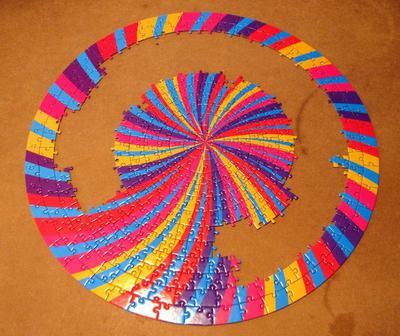 This puzzle looks so very pretty and colorful. It actually looks challenging too but it sounds like it is not as bad as a Puzzler might think.